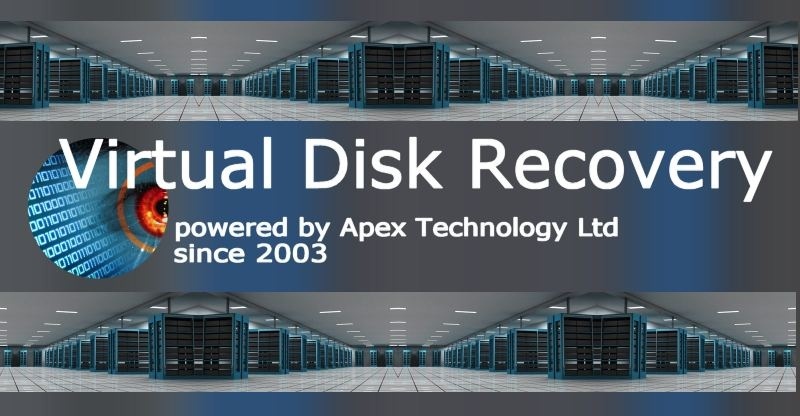 Apex Data Recovery are the experts in data recovery and can perform successful data recoveries for virtual machine, server or system. Virtual Disk Partitions and FileSystems may be lost on VMware®, Microsoft® Hyper-V®, Citrix® and Linux® XEN®, Oracle® VM systems. The VMFS may hold vmdk files, vdisk's, vhd files, NTFS operating systems. We perform recoveries from rack mounted Terastations, Fujitsu Fibrecats, HP Servers, Dell Servers. Data may be spread across RAID 5, iSCSI LUN's with NTFS and VMFS formatting of partitions. Disk Drive read errors usually cause the problems, and sometimes the unit tries to rebuild but gets stuck in a failed loop of Raid rebuild attempts, leading to raid errors. Another favourite here are SAS HDD's disk drives from HP MSA2324fc G2 running RAID 6 and VMWARE host. Disks in the ADG Array failed and the MSA put the vdisk virtual disk offline. Drives marked as LEFTOVR (left over) brought back online by customer using the Trust command which unfortunately overwrote some of the data as the disk had been out of sync while writing to other disks had continued with the raid in degraded mode (this did mean some files were corrupt so the best advice is do not use the TRUST command unless you do not care about the data). We rebuilt the raid and repaired access to the vmdk files allowing us to recover the data from the vdisk's. All the vdisks were vmware vmfs format. Virtual machines are often mounted on iSCSI devices, and the iSCSI LUNS are usually mounted on RAID5 or RAID6 systems. The raids are often constructed via LVM. Most of the NAS makers eg Buffalo, Qnap, HP, Intel, Fujitsu Siemens SX80i etc offer versions of their Network storage units specifically to be set up iSCSI storage. When used in conjunction with Microsoft's iSCSI initiator they can create LUNs, Virtual Volumes VMware ESX, VMFS partitions, Virtual Machines - VM's, Virtual Disks VDISK's, NTFS partitions to name a few. We have recovered Virtual Volumes, iSCSI Virtual Machines, ISCSI Virtual Disks Recovery. Click for Virtual Data Recovery News. Click for Virtual Data Recovery Reviews. We can also convert a virtual disk or virtual machine to a normal hard drive. Virtual Filesystem iSCSI vmdk vhd files Virtual Disks / Machines VMWare ESX problems that we recover data from are listed below. Recover Virtual Machine Disks Partitions VMware, Microsoft Hyper-V, Citrix and Linux XEN, Oracle VM VMFS, NTFS. Recover Virtual Filesystem vmdk vhd files Virtual Disks Machines Recovery VMWare ESX iSCSI LUN.